A comprehensive set of tools for uncovering Reiki’s most potent healing secrets. If you've felt the power of Reiki and want to broaden your experience, you now have the most extensive resource available for strengthening your practice of this extraordinary healing art. 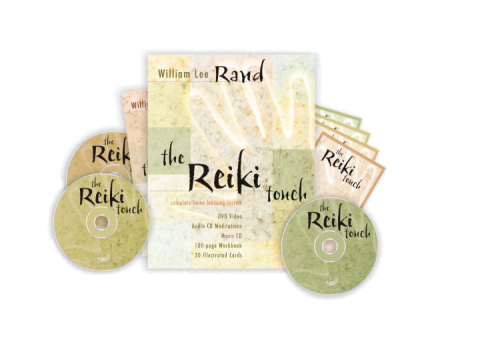 With The Reiki Touch, Reiki master William Lee Rand combines the advantages of video, audio, reference cards, and written instruction to provide a comprehensive set of tools for uncovering Reiki's most potent secrets. As one of the premier authorities on Reiki in the West, William Lee Rand has guided thousands of students through every level of Reiki training. Now this renowned teacher invites you to discover your ability to harness Reiki in ways beyond what has traditionally been taught to many advanced students. From mastering the fundamental hand positions for healing, to using the advanced techniques of Byósen scanning and Gyoshi ho (sending Reiki through the eyes), Rand provides the essential keys to Reiki for beginners and advanced practitioners alike. Whether you're a long-time Reiki practitioner or you've just received your first attunement, The Reiki Touch will provide the training and understanding you need to excel at this increasingly popular healing art. Please note: This program is not related to the Reiki Touch(R) work of Julia Carroll. Review for The Reiki Touch Review by I. Marie M.
I have used this set every day since I have recieved it. The guided meditiation is amazing, my friends think so too. The book is so informative, and answers many questions I had. The the whole package has also reminded me that giving myself reiki is just as important as giving Reiki to others. Yes, it is very useful and I have listened and watch almost daily.